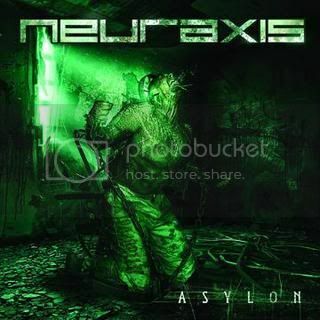 Montreal-based tech death metallers NEURAXIS have unveiled the track listing for their upcoming album, Asylon, which will be released in North America on February 15th. The track, 'Asylum', debuted last week and can still be heard at Prosthetic Records' webstore, where the official pre-order is now running. Vocalist Alex Leblanc commented on the decision to title the album Asylon: "'Asylum' is the first song I wrote for the album. It opened up a ton of ideas for all the other ones. After I was done writing all the lyrics, I was looking for the word asylum in Latin. I realized it did not exist but it did in ancient Greek. The word 'asylon' had a deeper meaning so it was more fitting to use it to globalize the whole mood/concept of the album." Asylon was recorded at Wildsound Studio with producer Chris Donaldson (CRYPTOPSY, THE LAST FELONY, THE AGONIST). The cover art was created by artist Dennis Sibeijn of Damnengine Artwork, who worked with the band on their previous album, The Thin Line Between, as well with JOB FOR A COWBOY, CHIMAIRA and more. Neuraxis will support death metal masters DEICIDE in February and March and legendary extreme metal act SEPULTURA in April and May. For more info and tour dates visit Myspace.com/neuraxis.